After handling hundreds of bike accident cases, South Carolina Bike Law attorneys, Peter and Timmy know the difference of a bicycle crash and bicycle accident. South Carolina bicycle crash lawyer and Bike Law founder Peter Wilborn has raced, toured, commuted, and ridden his bike daily for fun. In 1998, Peter had a bike tragedy in his own family, realized first hand the need for lawyers who understand cycling, and devoted his law practice to Bike Law. From the start, calls and referrals have come from friends in cycling clubs and bike shops and from advocates for better bicycling. Since then, Peter has represented hundreds of South Carolinians as their bicycle crash attorney who have been injured by motorists, unsafe road conditions, or defective cycling products. He has personally trained police officers throughout the State to better investigate bicycle crashes. Working closely with the Palmetto Cycling Coalition, he has promoted better laws and supported public service campaigns. Peter has represented injured cyclists in bicycle crashes in Charleston, Mt. Pleasant, Myrtle Beach, Columbia, Rock Hill, Aiken, Spartanburg, Greenville, and most places in between. After many years of using the phrase "bicycle accident," Peter and Bike Law officially "dropped the A word" and began using the term "bicycle crash." After many years of handling bike cases, we realized that bicycle crashes are not bicycle accidents because they are not accidental. Peter is a Life Member of the League of American Bicyclists and is a League Certified Bicycle Safety Instructor (#1864). For what it's worth, he is rated as an AV Preeminent Attorney (4.9 out of 5) and has received awards for his pro bono work from the South Carolina and American bar associations. Peter regularly speaks across South Carolina (and the country) to bicycle clubs, advocacy groups, and law enforcement personnel on bicycle safety, bicycle laws and as their South Carolina bicycle accident lawyer. He is especially interested in the etiquette and culture of cycling, and his article “The Lost Art of the Group Ride” has been downloaded over 75,000 times. Joining Peter in representing South Carolina cyclists is Timmy Finch. Timmy is a 2009 graduate of the Charleston School of Law. For the next five years he worked as a prosecutor in the Ninth Circuit Solicitor’s Office. He has extensive trial experience as a lead attorney and has handled thousands of complex cases of violent crime and sexual assault. A former bicycle messenger in Washington, D.C. and Seattle, Washington, Timmy has also raced on the road and track. Timmy still uses a track bike to get around Charleston, SC where he lives with his wife and son. Road riding is a passion and a release and Timmy rides every chance he gets. 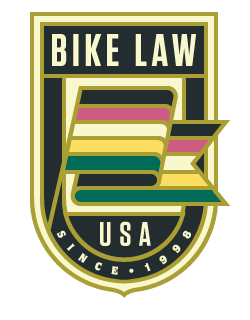 Peter Wilborn at Bike Law is the best choice should you be the unfortunate victim of a bike crash. He is an effective advocate and provided great service when I got hit by a distracted driver. Here are the South Carolina bicycle laws, as amended in 2008, that offer legal protection to cyclists in our State. Below are some of the key highlights. SECTION 56-5-3430. Riding on roadways and bicycle paths. HISTORY: 1962 Code Section 46-453; 1952 Code Section 46-453; 1949 (46) 466; 2008 Act No. 317, Section 3, eff June 10, 2008. The 2008 amendment rewrote this section, designating the subsections and adding subsections (B) and (C). SECTION 56-5-3435. Driver to maintain safe operating distance between motor vehicle and bicycle. HISTORY: 2008 Act No. 317, Section 3, eff June 10, 2008. SECTION 56-5-3440. Manner of riding bicycles; number of persons which may be carried. HISTORY: 1962 Code Section 46-454; 1952 Code Section 46-454; 1949 (46) 466; 2008 Act No. 317, Section 3, eff June 10, 2008. The 2008 amendment made nonsubstantive changes. SECTION 56-5-3445. Harassing or throwing object at person riding bicycle; penalty. If you have been injured in a South Carolina bike crash, by a defective bicycle product, or because of an unsafe road condition and would like to discuss your case with a South Carolina bicycle crash attorney who gets cycling, Peter and Timmy welcome your call for a free consultation. They can be reached at [email protected], [email protected], and 843-416-9060.